Traders Point Creamery has registered Trademark protection for the tagline of “Santa’s Official Milk,” to be featured on its organic, 100% Grassfed Whole Milk glass quart bottles during December 2017. Traders Point Creamery is committed to crafting the most nourishing dairy products possible. During the holiday season, their new Santa’s Official Milk, from their family of local farms, now offers a festive seasonal beverage that is both delicious and nutritious. 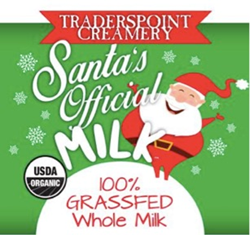 “Santa’s Official Milk was the brainchild of our plant manager, Mary Beth Klippel, who suggested this festive trademark for our whole milk during the holiday season,” says Mark Vander Kooy, CEO of Traders Point Creamery. “When you have talented people on your team, they bring great ideas, and we are excited to be the first official Santa milk on the market!” Traders Point Creamery turned to graphic designer Angie Foreman to create the festive look on the Santa’s Milk bottle. This new seasonal label follows on the heels of a recent redesign by Foreman of their entire organic, 100% grassfed product line. Santa’s Official Milk can be found in leading grocery chains and independent retailers throughout the Midwest for the month of December. “All holiday season, our elves will be working hard to make sure that when Santa comes down the chimney, families have his OFFICIAL milk to serve with those tasty cookies!” says Mark Vander Kooy, CEO. Traders Point Creamery is an organic, 100% grassfed dairy farm founded by Jane Elder Kunz and Dr. Peter “Fritz” Kunz. The company includes an award-winning line of dairy products, an on-site farm store, and The Loft Restaurant recently voted as a top food destination in Indiana. The creamery's products can be found nationally at natural foods retailers and grocery chains, and visitors are always welcome at the farm just outside Indianapolis. Located at 9101 Moore Road, Zionsville, IN. For more information, visit http://www.traderspointcreamery.com.